Discussion in 'Downhill & Freeride' started by Tarpon, Sep 27, 2005. Not sure what is the target market for the 6" travel bike but if its going to compete with the Nomad and the new Intense 6.6, the frame better be under 10lbs. the world has seen the light. 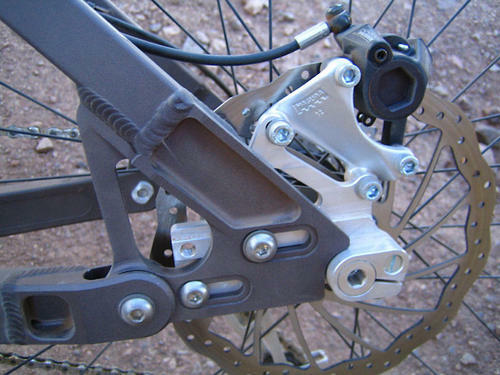 it is going to be a 6" bike with slack dh angles (all my e-speculum... e-speculation, sorry). probably gonna compete with the new transition, the devinci ollie, the turner HL, the IH Type 6, and proably even a few others we don't know about yet. The DeliriumT uses the same Quad DRAC bearing and dual 17mm axle pivot system as its heavier-duty sibling to ensure a high degree of lateral rigidity. However, the lighter frame package makes it suitable for extended climbing and epic all day riding. Featuring adjustable head angle and chain stay length, the DeliriumT can be quickly transformed into a nimble slope style competitor or short course DH racer. Clearance for 2.7" tires and climbing capable 16.4" chain stays mated with Knolly's patent pending Four by 4 Linkage create a truly versatile frame. A range of four frame sizes accomodates rider heights from 5'1" and up. Noel posted a comment last week about it being 9.somthing pounds. Translation: not really a direct competitor to a nomad or 6.6. More of a shorter travel freerider Looks cool, sounds cool, but probably more weight than I'd like to power up a 3000' ascent with. I guess we'll see when a real one exists, not a proto. It's a modern take on an old-school freerider. Not one of these new silly 30lb 6"+ bikes. interesting statement. care to elaborate on what you mean by "old-school freerider" vs. "silly 30lb 6?" LOL! Is there such a thing? What, you mean back in day like 2003 or something? And what's silly about 30 pounds? Are you just assuming they can't take a beating? "Ya, the 6" bike is going to be sweet: it looks a lot like the V-tach, but upon closer inspection it has quite a few noticeable differences. Firstly, it's about 2.5-3 pounds lighter, but should still will be quite laterally stiff and fairly burly. We're not competing in the lightweight long travel trail bike group, but in the "I like to abuse the s#!t out of my bike and if that means pedalling it up 5000' feet one day on a 6 hour epic, then hitting the lift serviced bike park the next day, so be it" crowd. It also has some cool features that will allow the bike to be built up as a low 30 pound long travel trail bike (with a fork like a Nixon, AM1 or Pike), or a high 30's 6" full on free ride bike (with a fork like the 36, 66, or even a travis single crown). We call it the 80% bike: it's about 80% of the cost, travel and weight of the V-tach"
80% of the cost still has me lookin at the new transition gran mal (assuming the features they have yet to disclose don't turn my stomach). i really like the look of the 6" bike and the idea of having an uninterupted seat tube on an FSR bike. 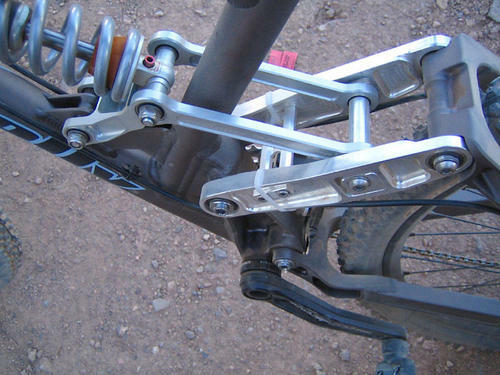 i'm just trying to figure out how that extra linkage is going to effect the feel of the suspension. it looks like it will be more rising rate than a typical 4-bar... anyone who knows their sh** feel free to chime in. I.E. built like my RFX, which has been around since the late 90's. Built like a DH bike (gusseted, straight-guage tubing = less dent prone, heavier construction, extra stiffness and durability), but able to ride on XC trails acknowledging a weigh penalty. Very durable. 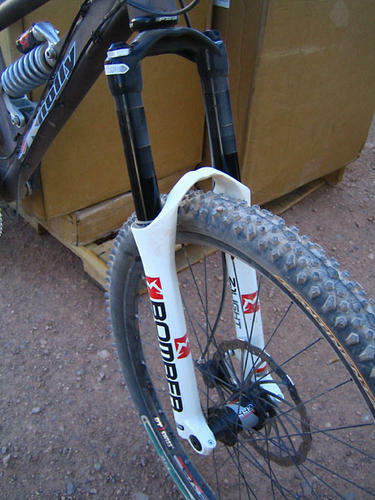 **the appearance recently of long-travel air forks and shocks can help make a bike much more tough and keep the weight low by dropping 2 pounds of coils, but I still think a 30 pound or under bike with 6" or more travel is a compromise. My bike is built with weight in mind yet strong, with full coil shocks, and is a struggle to keep it around 36 pounds. It's just under 7" ft/rr. Overkill?...maybe. But I'll put it up against any 30 pounder in a fight! 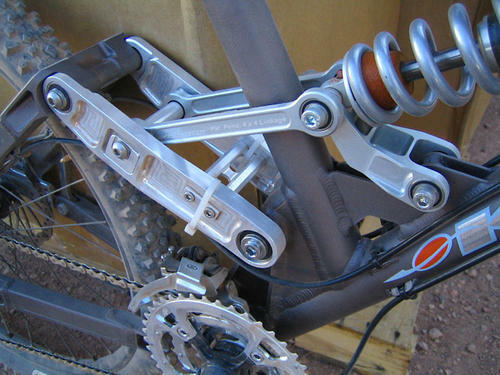 If Noel were being a geek like us and browsing the forums instead of kicking it back at Interbike in Vegas, he could easily answer your question about the linkage. All I can say is that the 4x4 linkage performs very well, I have yet to have a compalint with it. Old school = late 90's. If you're an actual "OGRipper" you'd remember! 30# builds are silly to me, IMO. I'll give you 2 *free* pounds to substitute an air shock and fork for the traditional coils, so that would make the build strength more like 32#. I say *free* because if I'm riding coil and you're riding air and we both blow up our shocks, I'm riding home on a pogo stick but you're walking home! Hahahaha, dude that's only like five or six years ago! Old school for me is the mid 80's when I was doing freestyle shows with a portable quarter pipe and riding my first mountain bikes. If you ask me, freeriding is pretty much too new to have an old school! But if it does have an old school, it's overweight bikes with too much travel and tires that are too damn big. Look at slopestyle comps from this year - 6x6 or so is the "new school." As for 30 lbs being silly: Don't be afraid. As tech advances things are going to get lighter without compromising strength. But I'll put it up against any 30 pounder in a fight! What if the fight starts at the bottom of the hill, or at the start of a 6-hour epic? Look at slopestyle comps from this year - 6x6 or so is the "new school." I'm a HUGE fan of 6" bikes. I think many guys would actually be better off on 6" than 8/9/10". Many riders are on too much bike. Not trusting/liking lightweight, long travel air sprung bikes is just a personal thing, as I stated before. It works great for a lot of people, but 6-7" trail bikes are just not my thing. I dont' wish them to go away though, I think everyone should be able to get what they want. Won't stop me from calling them silly though! I think everyone should be able to get what they want. Won't stop me from calling them silly though! damn you for having the right attitude. that's great and all but that hardtail makes no sense. um, it isn't? $2,560 for a frame and shock? sure seems like a lot to me. that said, I'd sure like to check it out built up. sorry, I was off $160. That is a lot for a frame but look what you get too. lol, yeah, that's gunna help keep the front end down on climbs. I've noticed this is one area where my new, longer, trail/fr bike is better than the old one. Even though my 6 pack is heavier than my old foes, the chainstays are quite a bit longer, and I have much less problems with the front end wanting to come off the ground during steep climbs. 16.4" is XC territory, way to short to do serious climbing on a bike with a high front end. Firstly - Chainstay length: 16.4 is the minimum length - it's adjustable up to 17.2" long, you can have your pick and set it where you want it. Bulldog's comments are pretty much our exact philosophy. 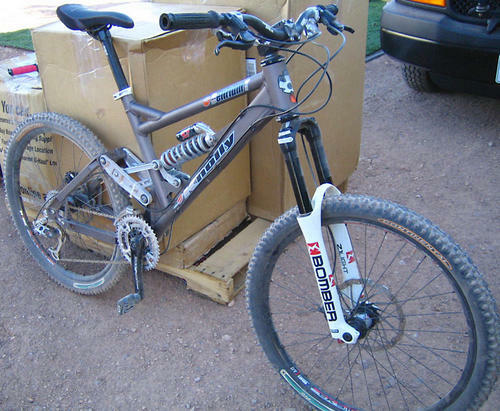 This bike is a solid all mountain frame, that also doubles as a light duty FR bike. Travel alone does not determine a frame's apptitude. Lateral rigidity, geometry, suspension characteristics, durability, reliability, tire clearance, etc... are also very important aspects of frame design. Suspension rate: The Delirium T is runs a fairly linear suspension rate. Apart from long travel DH bikes, there is not a lot of need for progressive rates these days since most shocks now feature air assist bottom out resistance: Progressive, Manitou, Fox, and the Marz Rocco all share this characteristic. Retail price is not finalized, but around 3000-3300 CDN depending upon the rear shock would be a good first guess. Speaking of shocks, this frame will run pretty much anything on the market: Progressive 5th element or Gravity air shock, Fox DHX or DHX air, and the Marz Rocco. The linkage uses a 2.5:1 leverage ratio so it's going to be butter with coil shocks! Frame weight with an air shock is going to be about 9.25 pounds for a medium frame. A 135 x 12mm rear through axle version will add about 0.2 pounds to the frame. 6hour epic including lots of technical climbing is no problem on a 34lb RFX with 6" front and rear. yup, my 6-Pack is around the same weight, I don't mind the long climbs because the descent rips. just go slower on the climbs, it's not a race anyway. Knolly Delerium T- Marzocchi Z1 Light/Progressive 5th Element Coil (6x6"). A yummy fork, a very yummy bike. I think Larry and I were the only people to ride this new model from Knolly, and this is the only one in existence so far. The V-Tach is well known, but Knolly decided to do a more trail-oriented model to diversify the line. This thing flat out ROCKS! The build is amazing and it rides extremely well. It is a fantastic pedaler and still plush as all get out. With the seat raised it takes on a pretty laid-back feel, but there is no suspension movement under power either seated or standing. The bike may have been a bit over-sprung for us, but it still soaked up bumps beautifully. This thing is BURLY. About 9.5 pounds with shock and designed around 6-7" forks. The rocker's shock mount is eccentrically placed in a square chip which can be rotated in 90 degree intervals to achieve 4 different bb heights (all result in the same travel). 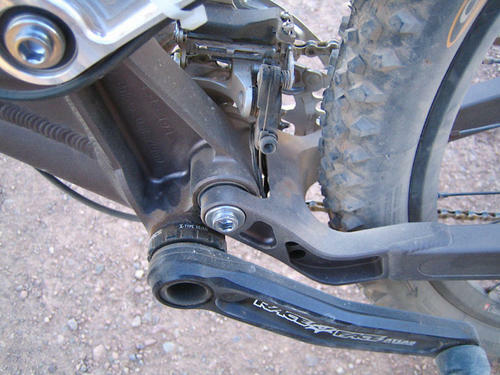 The rear drops can be moved to adjust the chainstay length between 16.4 and 17.2". The very slack seat tube angle could lead to some fit issues if you have long or short legs. This was a medium and still was fun for Larry and me to ride. The Z1 Light rode like a nice fresh Zoke. Very plush and well-mannered. It was the best feeling Zoke among those we rode in the two days. With a proper fit and setup it would could easily rival the 6-Pack and 6.6 for best 6" travel burly bike. Larry wants to order the first 3 Knolly puts out and I can see why. I just love that bike!! Seriusly, this and the V-tach are two of my favourites, without having ridden any of them. One V-tach is making its way overseas, gonna try to get a ride on that one as soon as possible. Thanks for the update. I'm hoping to get a test ride on both new Knolly's next month. It's good to see somebody actually riding new products at the Dirt Demo rather than old hat stuff (i.e. the losers at pinkbike test riding Demo 8's and VP-free's). Nice. Ever been to dirt demo? It's not like you can always pick and choose what you want to ride. No, never been to one. I really don't care what they ride but to report on a bike that has been out for a year (or close to it) like nobody has ever ridden one before is pretty lame. I just thought that i should make something very clear: the Delirium T is VERY MUCH a prototype. In fact, TS and Larry Mettler (who wrote the review) have more time on this frame than I do! The frame was finally assembled Monday evening: they are testing it with a shock from the V-tach on it instead of it's proper shock (because we were still waiting for new shocks to arrive) and the bike had NEVER been ridden before. Litteraly, I had pedalled it on a gravel road about 100m and back and that's all it had been ridden. So, we're very happy that they liked the bike, but it can not really be compared to other models in this test: they are production level frames, while there is only ONE Delirium T in existance and the owner hasn't even taken it off road yet! Of course, we hope to improve it even more, but please remember that their opinions are based on a frame that hasn't even gone through the first stages of product testing and review. So when will the frame be available? Sometime in 2006, 2007, 2008, 2009, or 2010?